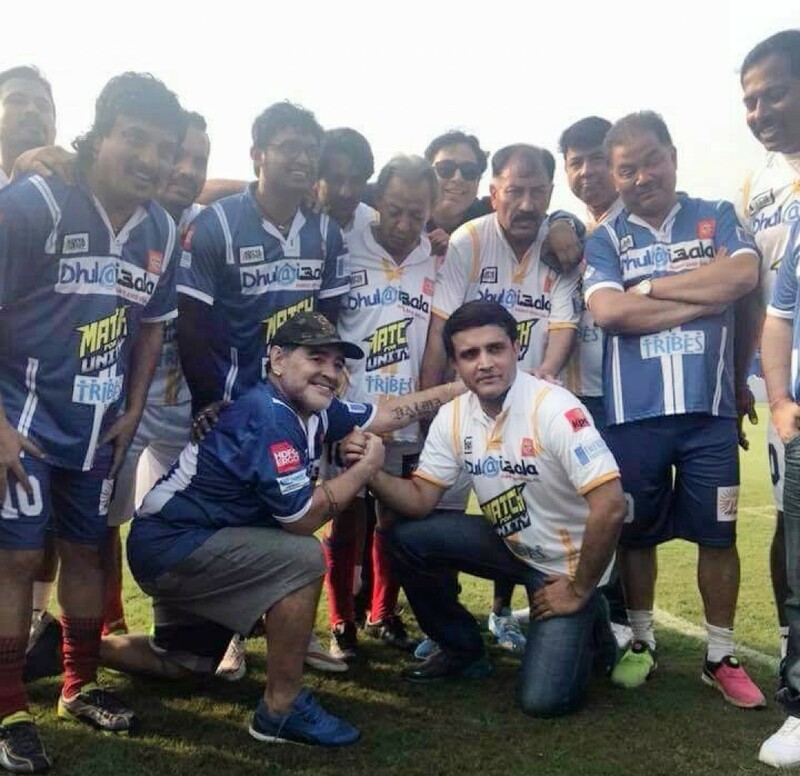 In a star-studded affair, a football match involving Diego Maradona vs Sourav Ganguly entertained India's footballing capital on Tuesday. "Football isn't a game, nor a sport, it's a religion"- this famous quote by Diego Maradona explains the scenario of football in West Bengal, a state which holds history and culture in this sport and definitely considers this beautiful game something beyond an art on the field. Being thousands of miles away from Kolkata, this legend from Lanus, Buenos Aires was always connected to the football fans in India. Worshipped as an idol by thousands of football lovers, the buzz when these fans got an opportunity to watch their idol in Kolkata was understandable. Kolkata never disappoints whenever there is an event related to football and Tuesday was no exception. Maradona was going to play a match against none other than former Indian cricket captain, Sourav Ganguly, the match being held at Aditya School of Sports in Barasat. The Argentine legend was greeted with a loud roar and as expected, the school ground gallery was jampacked and chants, of " Diego! Diego!!" echoed as he entered the ground. He started the event with his workshop, where about 40 young kids of the school got the golden opportunity to attend and learn the tricks from the 'God' himself. 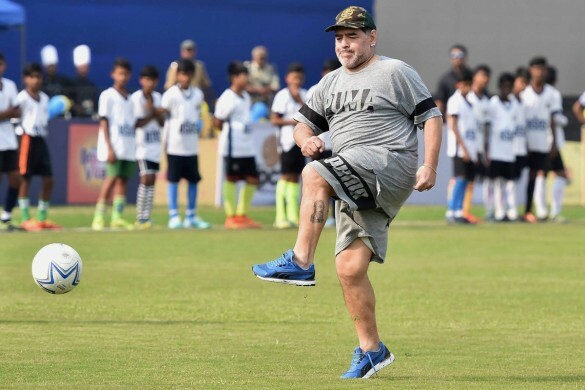 Maradona was showering the young kids with tips on how they can improve their shooting skills. The shooting drills continued for 30-40 minutes and it included different types of shooting techniques which will be of immense help for the kids in future. Throughout the event, famous sports journalist Gautam Bhattacharya and Cricket historian Boria Majumdar kept the crowd engrossed with their commentary. Then the Prince of Kolkata, Sourav Ganguly, arrived and the clash which so many people were waiting for the start. Both squads were filled with former footballers like Shyam Thapa, Dipendu Biswas, Biswajit Bhattacharya, Abhijit Mondal, Alvito D'cunha and many more. Current Bengal cricket captain Manoj Tiwary also joined the party as the veterans enjoyed their time playing the beautiful sport. The match ended with a 1-1 scoreline. 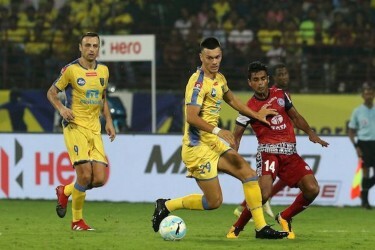 Manoj Tiwary scored a goal for Sourav Ganguly's side. Maradona also amazed everyone with his singing skills and his melodious tunes were well appreciated by the crowd. He enjoyed himself and watching him take the field definitely inspired a lot of young budding footballers who dream to set the stage on fire in future. “It would have been great had Maradona played. He had an injury, so he could not play. He is too good a player. Age has caught up with him now, but even then watching him from close quarters is a treat,” Ganguly told reporters after the match. The day was really auspicious for everyone present at the event and of course for the players who got the chance to get some tips to improve their football from the legend himself. Kolkata and its people will remember this day vividly for a long time, as they got to see their idol up close and personal once again having supported him voraciously during his playing days.